Bru’d (pronounced “bruuwd”, as wordplay on “brewed”) is an unorthodox nanobrewery from Amsterdam, born out of passion for cooking, eating and drinking. Bru’d was launched in 2013 with all the precision of a old Soviet Soyuz rocket, the obvious intention being the release of a berestroika into the world of beer! The brewers and establishers, Aike and Chiel, met in Groningen where they studied and where their passion for cooking and good food and drink grew. After they graduated they both worked for companies that required their minds more than their hands, which is why they are so grateful that they can make material products and share them with others who appreciate it. ‘The process of making something with your own hands and continually improving it in small steps, gives a great deal of satisfaction.’ Bru’d beers are frequently based on traditional beer styles, but they have an unexpected twist – such as the “Chubby Checker”. Aike and Chiel started brewing their own beer approximately seven years ago, after they moved to Amsterdam. 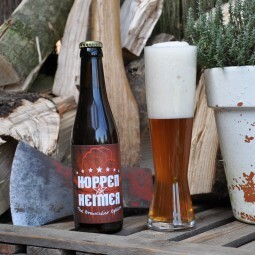 After much experimentation, a period during which they consumed the contents of most of their beer bottles themselves, they marketed their first bear a year and a half ago: a hoppy Kolsh named “Hoppenheimer”. Bru’d only makes beers they actually like themselves. Before selling any new beer they consider: ‘if we don’t sell this stuff we have to drink it ourselves, so it better be good.’ They take a lot of care when choosing the ingredients for their beer and only use the best (primarily organic) hop, malt and grains. They’re as involved in the brewing process as possible, for example by crushing the malt themselves. As such, the quality of their beer is generally considered even higher than the quality of their wordplay. Bru’d believes in the optimal usage of existing means of production and transportation. They primarily transport their beer by bicycle and follow the principle of “gypsy brewing” (a type of contract brewing) and utilise kettles that are temporarily unused. As someone who constantly creates unique recipes to be made by other brewers, Mikkel Borg Bjergsø (the man behind the famous Mikkeller beer – an interesting story in itself) is the paragon of the gypsy brewing world and an example to Aike and Chiel.